"Next Generation Mobile Data Services"
Mobile data traffic is at an all-time high, and its growth shows no signs of slowing. In response to the changing requirements and to enable the richer experience users expect, the mobile community is evolving new standards for the next generation mobile data services and technologies . What businesses need is a new class of devices, networks and services that offer seamless, multi-carrier platforms. 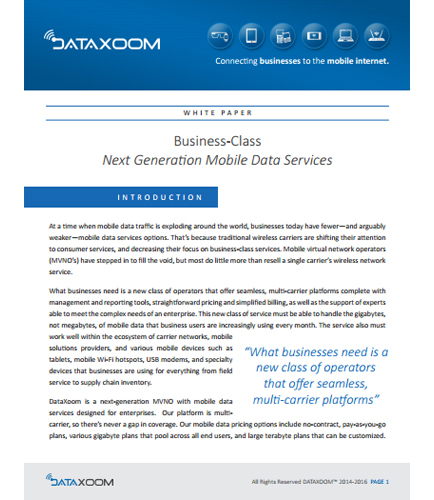 This whitepaper outlines the vision for the next generation of mobile technology. What are the must-haves for a best-in-class mobile data service? What do the mobile operators need to support the diversity and quality requirements of advanced, next generation mobile applications? How can a business focused wireless provider help you transform your business? Read this informative whitepaper to know how to meet the massive increase in the requirements of mobile internet and advanced data-intensive applications.